The second Barton (DD-722) was launched 10 October. 1943 by Bath Iron Works Corp. Bath Maine; sponsored by Miss Barbara Dean Barton granddaughter of Admiral Barton; and commissioned 30 December 1943 Commander J. W. Callahan in command. On 14 May 1844 Barton departed Norfolk and arrived at Plymouth England on the 27th. Between 3 and 26 June she carried out screening patrol and bombardment duties in support of the invasion of Normandy. On 4 June she rescued 31 American soldiers from the sinking LCT-2498. During a brisk engagement with German batteries at Cherbourg 25 June Barton was slightly damaged while delivering effective gunfire support. Returning to the United States 10 July 1944 Barton soon departed Norfolk for the Pacific arriving at Pearl Harbor 2 October. She then steamed westward to take part in the capture of Leyte including the Ormoc landings (9 November-8 December 1844) Mindoro landings (12-18 December) Lingayen Gulf landings (4-21 January 1945); Iwo Jima invasion including the 5th Fleet's supporting raids on Honshu and the Nansei Shoto (10-19 February 25 February-1 March); Okinawa invasion (21 March-30 June) and the 3rd Fleet raids on Japan (10-24 July). After a brief tour with the occupation forces in Japan Barton returned to Seattle 6 October 1945. She operated along the west coast until June 1946 when she departed Oakland for Bikini Atoll where she participated in Operation Crossroads (15 June-10 August). Returning to the United States she continued operations off the west coast until 22 January 1947 when she went out of commission in reserve at San Diego. 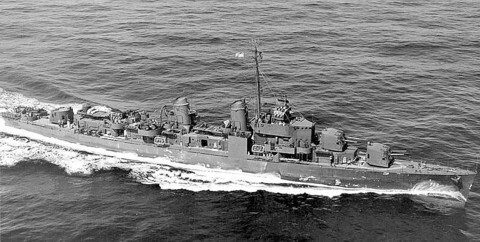 On 11 April 1949 Barton was recommissioned and joined Destroyer Division 201. She operated with the Pacific Fleet until 11 July when she got underway for Norfolk arriving 5 August 1949. During the next three years she operated along the eastern seaboard made two cruises to the Caribbean: and one cruise with the 6th Fleet in the Mediterranean. On 15 May 1952 Barton departed Norfolk via the Panama Canal for Korea arriving at Yokosuka Japan 18 June. She Joined TF 77 as a member of a hunter-killer group for operations along the east coast of Korea. On 10 August 1952 while silencing enemy batteries on the island of Hodo Pando Barton was hit on her number one stack by a 105 mm. shell from an enemy shore battery. Two men were wounded. After a short repair period at Yokosuka (25-31 August) she returned to Korean waters. While operating with TF 77 she was struck by a floating mine 16 September 1952 and had five men missing and seven wounded. Effective damage control by her crew enabled her to reach Sasebo for temporary repairs (29 September-19 October) and then Norfolk via the Suez Canal for permanent repairs. She arrived at Norfolk 12 December. Repairs completed 15 August 1953 Barton spent the remainder of the year operating along the east coast and in the Caribbean. On 4 January 1954 Barton returned to the Far East and operated as a unit of TF 77 patrolling the operating area from Okinawa to Formosa. Barton returned to Norfolk via Capetown South Africa 10 August 1954. Since that time she has operated out of Norfolk on training exercises and fleet maneuvers. She has also made one cruise with the 6th Fleet in the Mediterranean. Barton received the Navy Unit Commendation for services rendered coring the Okinawa operation and six battle stars for her World War II service as well as one battle star for Korea.